Worldwide, bronchogenic carcinoma is the most common cause of cancer death in both men and women. In the US, approximately one third of cancer deaths occur as a consequence of lung cancer, and approximately 170,000 new cases of lung cancer occur annually. The 5-year survival rate is 14%, and it has largely remained unchanged for decades. Lung cancer kills more people than colorectal, breast, and prostate cancers combined. Approximately 45% of lung cancer cases occur in women, and in North America, the number of deaths resulting from lung cancer has surpassed the number of deaths resulting from breast cancer. Images of non-small cell lung cancer are provided below. Non–small cell lung cancer. Bronchoscopy. A large central lesion was diagnosed as non–small cell carcinoma. Non–small cell lung cancer. Left upper collapse is almost always secondary to endobronchial bronchogenic carcinoma. For the purpose of treatment and prognosis, lung cancer is divided into 2 categories: small cell lung cancer and non–small cell lung cancer. Non–small cell cancer requires meticulous staging, because the treatment and prognosis vary widely depending on the stage. In non–small cell lung cancer, surgical resection offers patients the best chance for survival. Surgery may be curative for stage I and stage II disease; however, only a minority of patients (20-25%) have disease at these stages. Patients with stage IIIA disease may be candidates for surgical resection. In patients with stage IIIB disease, the tumors usually are considered unresectable. Patients with stage IV disease have distant metastases and are offered nonsurgical treatment, with the exception of rare cases of resectable solitary metastasis in a patient who also has a resectable primary lesion. See Lung Cancer Staging -- Radiologic Options, a Critical Images slideshow, to help identify stages of the disease process. Most patients with stage I and stage II disease require preoperative or intraoperative mediastinal dissection for accurate staging prior to lung resection. The overall surgical mortality rate following lung resection is 3.7%. The mortality rate is higher (6-9%) in patients requiring pneumonectomy and in patients older than 70 years. The overall 5-five year survival rate may depend on whether the tumor is stage T1 or stage T2. The overall 5- and 10-year survival rates are 75% and 67%, respectively, in patients who undergo resection for stage I disease. Patients with stage IIA (T1 N1) tumors have a survival rate of approximately 50% at 5 years, whereas patients with stage IIB (T2 N1 and T3 N0) tumors have a 40% survival rate. Patients with stage IIIA (T1 or T2 N2) tumors have been reported to have a 5-year survival rate of 29%. The 5-year survival rate in patients with complete resection of stage IIIB tumors is 49% in T3 N0 disease, 27% in T3 N1 disease, and 15% in T3 N2 tumors. For patients with stage IV disease, the median survival is 8.5-21 weeks, and the 1-year survival rate is 10%. See Non-Small Cell Lung Cancer Staging for summary tables. The overall 5-year survival rate is grim because most patients with non–small cell lung cancer present with locally advanced or metastatic disease. Approximately 65-80% of patients present with unresectable disease. At present, the National Cancer Institute and other medical associations and regulatory bodies do not recommend early screening for lung cancer as part of a periodic health examination. In a malignancy such as bronchogenic carcinoma, early detection can lead to surgical resection of the lesion and cure. Unfortunately, to date, the use of radiologic modalities has not proven successful in reducing mortality rates. For screening of non–small cell carcinoma of the lung, chest radiography may result in improved survival, although a mortality benefit has not been confirmed. On the basis of results from the Mayo Lung Project and a Czechoslovakian study, the American Cancer Society does not recommend routine mass screening for the detection of lung cancer. However, early stage detection, resectability, and survival improve with chest radiographic screening in high-risk populations. Studies have shown that low-dose helical CT scan of the thorax may detect lesions at an earlier stage and, therefore, may potentially improve resectability, survival, and mortality rates. Radiologic manifestations of bronchogenic carcinoma include obstructive pneumonitis or atelectasis, lung nodule or mass, apical mass, cavitated mass, or nodule or mass associated with lymphadenopathy. Chest radiography is a readily available, inexpensive, and useful imaging modality in the workup of patients with non–small cell carcinoma. Therefore, chest radiography is used most often as an initial investigation. The roles of MRI and positron emission tomography (PET) scan are not as well defined. MRI may be superior to CT in the assessment of the chest wall invasion by apical tumors. The use of PET scanning is expanding rapidly. Chest radiography remains the primary means of radiographic assessment of lung carcinoma. However, 12-30% of lung cancers are missed on chest radiographs. A nodule smaller than 2-3 mm may not be detected by using chest radiographs, and overlapping soft tissue opacities may hide small endobronchial lesions. 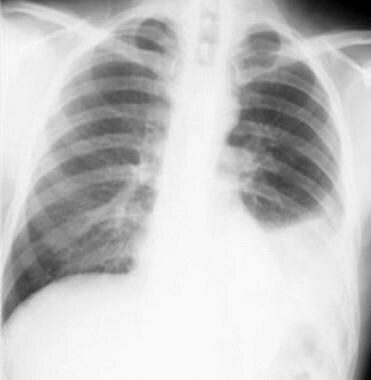 Chest radiographs depict indirect signs of endobronchial lesions such as obstructive pneumonia or atelectasis. These signs may well be secondary to benign tumors or mucus plugging or a foreign body. In a solitary lung nodule, probability of malignancy is approximately 40% overall; therefore, a nodule identified on a chest x-ray requires further diagnostic workup to exclude lung cancer. The advantage of CT scanning in non–small cell lung cancer is that it can be used to distinguish tumor from surrounding atelectatic lung. CT scans may be helpful in demonstrating superior vena cava compression, pericardial effusion, and lymphangitic dissemination in several other conditions. A major limitation of CT scanning is the inability to distinguish invasion from simple approximation to adjacent structures. In staging of non–small cell carcinoma, CT has several limitations. Normal-sized mediastinal lymph nodes may contain microscopic metastatic deposits that are subsequently identified on thoracotomy in as many as 20% of patients. Similarly, enlarged inflammatory nodes may be falsely characterized as metastases in as many as 20% of patients. The sensitivity and specificity of CT in detecting metastatic mediastinal lymph node involvement is in the range of 70-80%. CT scanning may have further limitations in distinguishing stage IIIA disease from stage IIIB disease. In a peripheral TI lesion, CT probably does not contribute, because chest radiography appears to be sufficient. CT is also limited in evaluating the extent of endobronchial abnormalities. CT may also be limited in evaluating and staging apical lung tumors. For excellent patient education resources, visit eMedicineHealth's Cancer Center. Also, see eMedicineHealth's patient education articles Lung Cancer, Bronchoscopy, Lung Cancer Medications, and Non-Small-Cell Lung Cancer. 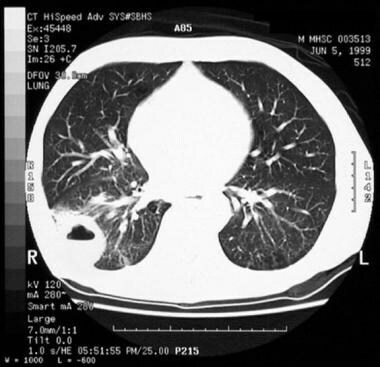 The role of chest radiography in screening for lung cancer remains unanswered. Three large randomized trials demonstrated a decreased lung cancer mortality rate in the screening group, but none of these 3 centers had an untested control group. 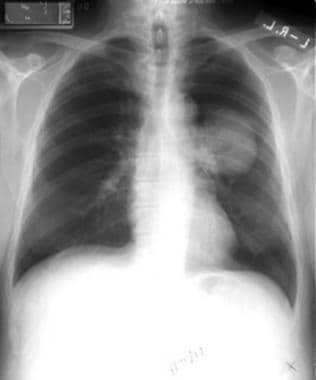 Radiographic images of non-small cell lung cancer and associated morbidity are provided below. Non–small cell lung cancer. Left pleural effusion and volume loss secondary to non–small cell carcinoma of the left lower lobe. The pleural effusion was sampled and found to be malignant; therefore, the lesion is inoperable. Non–small cell lung cancer. Complete left lung collapse secondary to bronchogenic carcinoma of left mainstem bronchus. Non–small cell lung cancer. A cavitating right lower lobe squamous cell carcinoma. Non–small cell lung cancer. Patient has right lower lobe opacity. This is not well circumscribed and was found to be a squamous cell carcinoma. Non–small cell lung cancer. Right upper lobe lesion diagnosed as adenocarcinoma on percutaneous biopsy. Non–small cell lung cancer. Right upper lobe collapse with the S sign of Golden secondary to underlying non–small cell carcinoma of the bronchus. 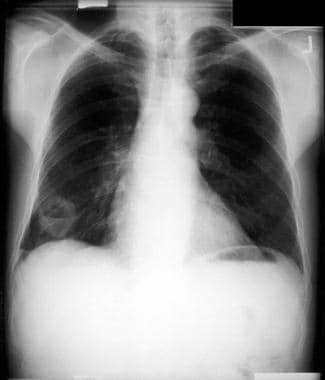 On chest radiography, the findings of non–small cell lung carcinomas are varied and considered in the differential diagnosis of many disorders. The most common findings are described below. Bronchial stenosis and poststenotic changes are common, because most non–small cell carcinomas demonstrate intraluminal growth. Narrowing of the main bronchi or a complete cutoff can be identified on chest radiographs. An endobronchial lesion commonly leads to partial or complete atelectasis and is the most common sign of bronchogenic carcinoma. 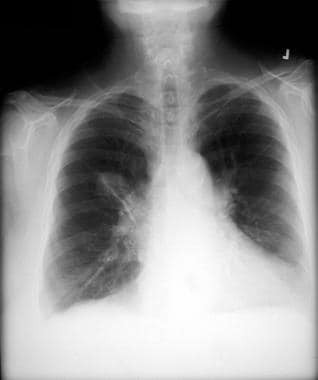 Complete endobronchial obstruction can sometimes produce distal mucoid impaction, which may be visible on plain radiographs as a tubular or branching opacity. 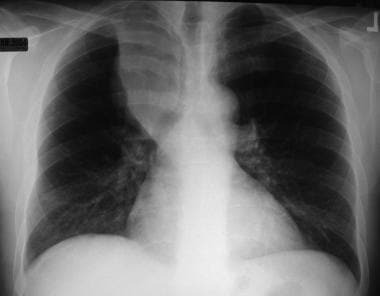 Atelectasis of a segment, a lobe, or an entire lung may occur. Radiographic signs include patchy irregular or homogeneous opacities in a lobar or segmental distribution. A loss of lung volume may be seen, as well as displacement of interlobar fissures, the mediastinum, the diaphragm, and the ribs. Postobstructive pneumonia may be identified in a segmental or lobar distribution. In patients with recurrent pneumonia, bronchogenic carcinoma is suggested unless proven otherwise. An endobronchial lesion reduces the ventilation despite normal or increased air volume. As a result, hypoxic vasoconstriction reduces perfusion, and attenuation is seen as hyperlucency on chest radiography. In partially atelectatic areas of the lung, hyperlucency rather than opacity may be evident. Central bronchogenic carcinomas manifest added opacity in the hilar region. In the early stage, the tumor may fill the lateral concavity of the hilar shadow, and in the advanced stage, all hilar structures are obliterated. Infiltration of lymphatics with bronchogenic carcinomas may be demonstrated as linear opacities radiating from the hilar mass into the lung periphery. A solitary pulmonary nodule may be relatively well marginated and appears as a rounded lung opacity. Reportedly, a solitary pulmonary nodule is benign in as many as 60% of patients in some series. All patterns of calcification except eccentric or scattered punctate (stippled) calcification are associated with a benign lesion. Procuring and identifying the lesion on previous chest radiographs is extremely important. This may help establish the doubling time interval for the nodule. A doubling time of 30-365 days commonly is associated with a malignancy. An ill-defined homogeneous or patchy consolidation in a segmental or nonsegmental distribution may be an indication of bronchogenic carcinoma. Patients with these findings often are treated initially for pneumonia; the lack of response to antibiotic therapy suggests the diagnosis of a malignancy. The opacity may contain air bronchograms and air alveolograms. This presentation is often seen with adenocarcinoma and bronchoalveolar carcinoma. Metastases to paratracheal, tracheobronchial, peribronchial, aortopulmonary, and subcarinal lymph nodes may be identified on chest radiographs. 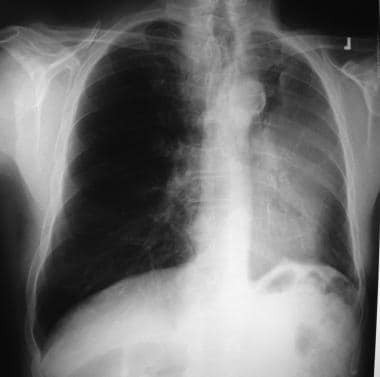 The radiographic signs include a widened mediastinum, an increase in the right paratracheal stripe, a convex margin of the mediastinum, an absence of concavity in the aortopulmonary window, and splaying of carina. Percutaneous transthoracic needle biopsy (PTNA) is used for the diagnosis of lung cancer. 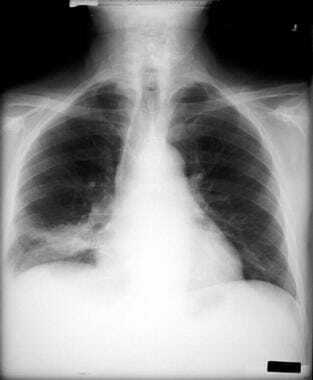 Chest radiographs are recommended at 1- and 4-hour intervals after the biopsy is performed, unless the patient appears to be hypoxemic or unstable, in which case chest radiography should be performed immediately. 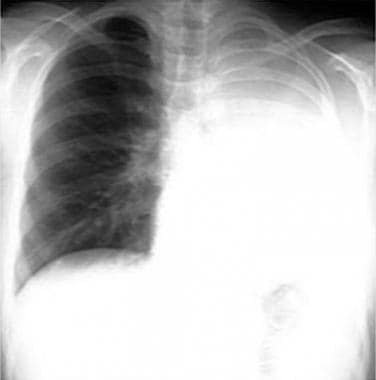 A small or asymptomatic pneumothorax may be followed at an interval of 2-4 hours with repeat chest radiography. If the pneumothorax remains stable and patient is asymptomatic, chest tube drainage is not required. In an enlarging pneumothorax (15-30% pneumothorax) or a symptomatic patient, a pneumothorax drainage catheter should be placed and connected to a Heimlich valve or Pleurovac system. CT scanning of the thorax plays multiple roles in evaluation of patients with bronchogenic carcinoma. These include lung cancer screening, evaluation of a solitary pulmonary nodule, and staging. A few trials have used low-dose helical CT to screen patients at risk for lung cancer. CT has depicted noncalcified nodules, although a small number have been found to be malignant. CT plays a significant role in workup of solitary pulmonary nodules. CT scans may also help establish a specific diagnosis in some patients. CT densitometry may help in differentiating between benign and malignant lesions. In addition, CT scans may help in the diagnosis of arteriovenous fistulas, rounded atelectasis, mucoid impaction, and lung infarcts. CT scans may also help in identifying a fungus ball that is not well delineated on a chest radiograph. A peripheral nodule with an ill-defined, irregular, and spiculated border is malignant in more than 90% of patients. In addition, air bronchogram findings and pseudocavitation (focal lucency) are seen more commonly in malignant nodules. Cavitation, demonstrated in the image below, may be a feature of malignant and benign lesions. Non–small cell lung cancer. CT scan shows cavitation and air-fluid level. The thickness of the wall cavity may be helpful in distinguishing between benign and malignant lesions. A wall of less than 1 mm indicates a benign lesion in 95% of patients, and a wall thickness of more than 15 mm indicates a malignant lesion in more than 80% of patients. CT densitometry is useful in detecting the presence and distribution of calcification and fat within solitary nodules. CT scan is more sensitive than chest radiography for detecting the presence of calcification. Approximately one third of indeterminate nodules found on chest radiography can be demonstrated to have calcium on CT scans. CT numbers can be obtained by placing a cursor over the lesion; a value of more than 200 HU indicates calcification. The presence of fat, detected either from direct visualization or from CT numbers ranging from –40 to –120 HU, is diagnostic of hamartoma. Enhanced scans may help in distinguishing between malignant and benign lesions. Malignant lesions enhance to a greater degree than do benign lesions after the administration of a contrast material; however, active granulomas or other infectious lesions can also enhance. A measurement of CT numbers during enhancement is useful. An increase of 20 HU or more indicates a sensitivity for lung cancer of 98% and a specificity of 73%. Contrast enhancement may be used in patients who do not have characteristic findings of either malignant or benign lesions. The nonenhancing nodules may be monitored as long as other features suggesting malignancy are not present. CT scans may be useful in evaluating primary tumors. Although the size of the tumor, whether the lesion is T1 or T2, may not change the surgical approach, the site of the tumor is important to identify. CT scans may be helpful in determining tumor extension across the major fissure. CT scans are useful in assessing local invasion of the chest wall, mediastinum, mainstem bronchus, central veins, and arteries. Signs of chest wall invasion include bone destruction, tumor extension into the chest wall, pleural thickening, and loss of extrapleural fat plane. Identification of mediastinal invasion with CT usually is unreliable. In addition, minimal mediastinal fat invasion may be resectable in many cases. Tumor invasion of the central arteries and veins may be identified by using CT, which indicates that a pneumonectomy is required. Tumor invasion of the mainstem bronchus can also be visualized on CT scans. This is a useful finding for planning the surgical procedure. CT is a useful radiologic modality for noninvasive anatomic evaluation of the hila and mediastinum. The indication of metastasis primarily is based on size criteria. A lymph node with a short-axis diameter of more than 1 cm is defined as enlarged. Although the probability of metastasis increases with increasing lymph node size, CT scanning is not helpful in differentiating a metastasis from a benign lesion. Normal-sized lymph nodes have been reported in 7-33% of patients undergoing CT staging. In addition, controversy exists over whether the short-axis or the long-axis diameters should be used in imaging. Another limitation may be interobserver variability in the interpretation of imaging studies. Despite the limitations, CT provides useful staging information to the surgeon. Noting enlargement in a specific location may help surgeons in planning procedures, including mediastinoscopy, mediastinotomy, or percutaneous needle aspiration biopsy. CT is useful in demonstrating extrathoracic metastases. Distant metastases demonstrated with CT include metastases to the adrenal glands, brain, bones, liver, and soft tissues. Chest CT should include the upper abdomen to assess the liver, upper abdominal lymph nodes, and adrenal glands. However, on needle biopsy, most adrenal masses are shown to be adenomas rather than metastases. CT scans are used extensively for staging non–small cell lung cancer; however, CT staging leads to either overestimated or underestimated staging in approximately 40% of patients. MRI is an imaging modality with several advantages, including a lack of ionizing radiation, the ability to image vascular structures without contrast media, the ability to image in any plane, and superior contrast resolution. MRI is not useful as an initial imaging tool, but it may be superior to CT in the evaluation of local invasion and detection of hilar lymphadenopathy. In particular, MRI is useful in the evaluation of superior sulcus tumors. Invasion of the brachial plexus, subclavian vessels, and adjacent vertebral bodies can be demonstrated with MRI. Compared with other techniques, MRI may be slightly more accurate in detecting extranodal tumor extension into the mediastinum. The multiplanar capability of MRI enables a more accurate evaluation of hilar lymph nodes, aortopulmonary window lymph nodes, and subcarinal region lymph nodes than does CT scanning. In addition, MRI can be helpful in identifying the relationship of the tumor to the central pulmonary artery, aorta, carina, and main bronchi. MRI depends on size criteria for the detection of mediastinal metastases. MRI is limited in detecting small lymph nodes containing microscopic deposits. MRI can be used as an imaging modality for apical or superior sulcus lung tumors. MRI is superior in detecting invasion of the chest wall, vertebral body, subclavian vessels, and brachial plexus. For the detection of chest wall invasion, a sensitivity of approximately 90% and a specificity of 96-100% has been reported. MRI is not able to depict calcification. Blood vessels with low flow may be misdiagnosed as lymph nodes or masses. Respiratory or other motion may cause blurring of images, leading to a missed diagnosis of lymphadenopathy. In patients who have biochemical or physical evidence of bone metastasis, a bone scan is required as part of the preoperative workup. A routine bone scan is usually not recommended in asymptomatic patients. PET can be used to determine the metabolic activity rather than the morphologic features of the lesions. Bronchogenic carcinoma is associated with an increased rate of glucose metabolism. PET uses deoxyglucose linked to fluorine 18 (a positron emitter). The agent, 2-[fluorine-18]-fluoro-2-deoxy-D-glucose (FDG), competes with glucose for transport into the cells and after phosphorylation accumulates in tumor cells. Lung tumor cells have increased glucose metabolism; however, this is not specific for tumors and may occur in infectious or inflammatory processes. PET imaging has higher sensitivity, specificity, and accuracy than does CT scanning in staging mediastinal disease. Published studies have demonstrated a sensitivity of 80%, an overall specificity of 92%, and an accuracy of 92%, with a positive predictive value of 90% and a negative predictive value of 93%. False-negative studies can occur in patients with carcinoid syndrome, bronchoalveolar carcinomas, and bronchogenic carcinoma measuring less than 10 mm. False-positive findings are known to occur in infectious or inflammatory disorders such as tuberculosis, histoplasmosis, and rheumatoid nodules. Ravaioli A, Papi M, Pasquini E, Marangolo M, Rudnas B, Fantini M, et al. Lipoplatin monotherapy: A phase II trial of second-line treatment of metastatic non-small-cell lung cancer. J Chemother. 2009 Feb. 21(1):86-90. [Medline]. Ohba T, Yamasaki T, Endo Y, Furuie M, Ohtani Y, Inase N, et al. A phase I study of TS-1 plus carboplatin in patients with advanced non-small-cell lung cancer. J Chemother. 2009 Feb. 21(1):80-5. [Medline]. Ricciardi S, Tomao S, de Marinis F. Toxicity of targeted therapy in non-small-cell lung cancer management. Clin Lung Cancer. 2009 Jan. 10(1):28-35. [Medline]. Herbst RS, Lynch TJ, Sandler AB. Beyond doublet chemotherapy for advanced non-small-cell lung cancer: combination of targeted agents with first-line chemotherapy. Clin Lung Cancer. 2009 Jan. 10(1):20-7. [Medline]. Martini N, Bains MS, Burt ME, et al. Incidence of local recurrence and second primary tumors in resected stage I lung cancer. J Thorac Cardiovasc Surg. 1995 Jan. 109(1):120-9. [Medline]. Reck M, von Pawel J, Zatloukal P, Ramlau R, Gorbounova V, Hirsh V, et al. Phase III trial of cisplatin plus gemcitabine with either placebo or bevacizumab as first-line therapy for nonsquamous non-small-cell lung cancer: AVAil. J Clin Oncol. 2009 Mar 10. 27(8):1227-34. [Medline]. Fidias PM, Dakhil SR, Lyss AP, Loesch DM, Waterhouse DM, Bromund JL, et al. Phase III study of immediate compared with delayed docetaxel after front-line therapy with gemcitabine plus carboplatin in advanced non-small-cell lung cancer. J Clin Oncol. 2009 Feb 1. 27(4):591-8. [Medline]. Hanna N, Neubauer M, Yiannoutsos C, McGarry R, Arseneau J, Ansari R, et al. Phase III study of cisplatin, etoposide, and concurrent chest radiation with or without consolidation docetaxel in patients with inoperable stage III non-small-cell lung cancer: the Hoosier Oncology Group and U.S. Oncology. J Clin Oncol. 2008 Dec 10. 26(35):5755-60. [Medline]. Guerra L, Meregalli S, Zorz A, Niespolo R, De Ponti E, Elisei F, et al. Comparative evaluation of CT-based and respiratory-gated PET/CT-based planning target volume (PTV) in the definition of radiation treatment planning in lung cancer: preliminary results. Eur J Nucl Med Mol Imaging. 2013 Nov 1. [Medline]. Dane B, Grechushkin V, Plank A, Moore W, Bilfinger T. PET/CT vs. non-contrast CT alone for surveillance 1-year post lobectomy for stage I non-small-cell lung cancer. Am J Nucl Med Mol Imaging. 2013 Sep 19. 3(5):408-16. [Medline]. [Full Text]. Mattes MD, Moshchinsky AB, Ahsanuddin S, Rizk NP, Foster A, Wu AJ, et al. Ratio of Lymph Node to Primary Tumor SUV on PET/CT Accurately Predicts Nodal Malignancy in Non-Small-Cell Lung Cancer. Clin Lung Cancer. 2015 Jun 15. [Medline]. Mattes MD, Weber WA, Foster A, Moshchinsky AB, Ahsanuddin S, Zhang Z, et al. A Predictive Model for Lymph Node Involvement with Malignancy on PET/CT in Non-Small-Cell Lung Cancer. J Thorac Oncol. 2015 Aug. 10 (8):1207-12. [Medline]. Nair VS, Gevaert O, Davidzon G, Napel S, Graves EE, Hoang CD, et al. Prognostic PET 18F-FDG uptake imaging features are associated with major oncogenomic alterations in patients with resected non-small cell lung cancer. Cancer Res. 2012 Aug 1. 72(15):3725-34. [Medline]. [Full Text]. Miller WT. Value of clinical history. AJR Am J Roentgenol. 1990 Sep. 155(3):653-4. [Medline]. Swensen SJ, Brown LR, Colby TV. Lung nodule enhancement at CT: prospective findings. Radiology. 1996 Nov. 201(2):447-55. [Medline]. Hellwig D, Baum RP, Kirsch C. FDG-PET, PET/CT and conventional nuclear medicine procedures in the evaluation of lung cancer: A systematic review. Nuklearmedizin. 2009 Jan 14. 48(1):[Medline]. Fried DV, Mawlawi O, Zhang L, Fave X, Zhou S, Ibbott G, et al. Stage III Non-Small Cell Lung Cancer: Prognostic Value of FDG PET Quantitative Imaging Features Combined with Clinical Prognostic Factors. Radiology. 2015 Jul 15. 142920. [Medline]. Non–small cell lung cancer. Comparative characteristics of the primary tumor are shown in the vertical columns. Horizontal columns refer to lymph node involvement. The different stages are color coded and can be found at the intersection of appropriately matched horizontal and vertical columns. Stages with unique characteristics, such as stages 0 and IV, are defined in separate boxes. Courtesy of Lababede et al (Chest 1999; 115(1): 233-5).